A couple weeks ago I mentioned seeing two new products at NAMM that hit me right in the heart of what brought me here in the first place: an obsession with recording drums. 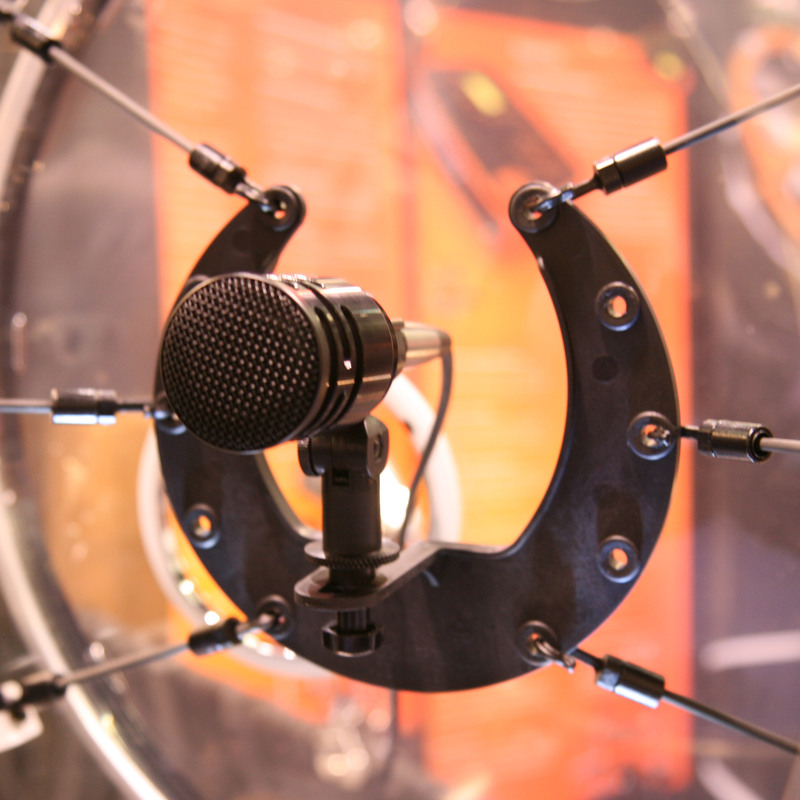 The first was the Kelly Shu, a new shockmount system for kick-drum microphones. The second was a crazy-cool hardware EQ device for kick drum. 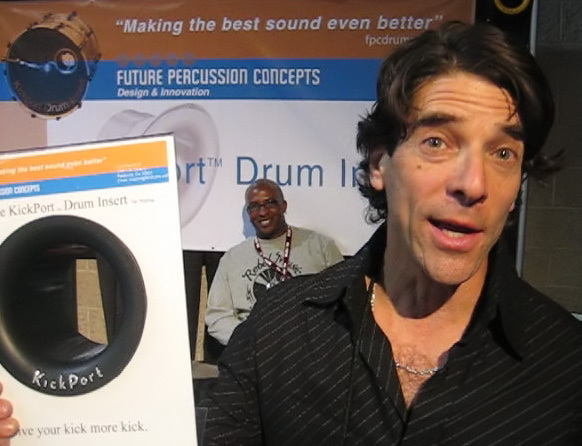 It’s called the KickPort, from Future Percussion. Plug it into the hole in the drum’s front head, and it makes the drum sound like a cannon. Seriously. Even amidst the din of the NAMM show floor, the effect was immediate and obvious; the bass drum in the FPC booth got louder and lower, deeper and more focused. To be clear, the drum sounded great before. But better after. The video I shot may well be the world’s worst demo video ever. 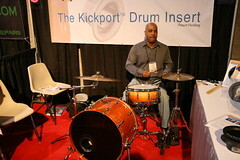 To set the scene: I was at the Kickport booth when Dante Roberson came by. Dante is a phenomenal drummer, as you will see. (Check out his wikipedia entry.) But we were unfortunately surrounded by hacks and wannabes, pounding and pecking away at the hundred other drum kits within earshot. The tiny $0.49 omnidirectional mic in my so-called video camera did a remarkable job of picking up every sound in the room. There’s no question Dante could sound like three drummers if he wanted too. But in this video, I’m afraid you’ll really hear three drummers. Nonetheless, if you focus on the kick drum, you will still hear a distinct improvement in its sound, even as recorded by the lowest-fi microphone to attend Winter NAMM 2009. I shot a second video, of FPC rep Jesse Bradman giving an introduction to and description of the Kickport. The video looks great, but the audio sounds a little like the warmup room of the USC Marching Band drum section. Bradman was barely 24'' away, but completely inaudible. I followed up with Jesse later to get the scoop on the KickPort. It was invented by Sammi Millender, whose idea was to treat an acoustic drum like a speaker enclosure. Most small speakers use a “tuned port” to improve the efficiency and lower the effective frequency response of the device (read more about that here). Similarly, I believe the KickPort derives some of its “eq” benefits from the length of its cylinder (as this is one of the two variables a speaker designer can tweak to “tune” a port); Jesse says that the more important component is that the KickPort acts as a damping mass that couples to the resonant head. Note that this damping happens without making shell contact. In most cases, KickPort users can remove internal damping materials (pillows, blankets, liberated hotel-room bath towels and so on), which increases the internal resonant cavity in the drum, resulting in improved resonance and tone. 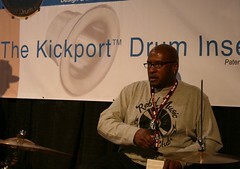 I asked Jesse whether the KickPort favors a particular drum size or tuning style. He was refreshingly forthright in his response. It will work well on all types of drums, but like anything, results will vary. The more resonance the the drum has, the better… The user may have to adjust his/her rig to achieve best results. That said, some drummers have it just “popped it in,” made NO adjustments and have achieved great results in live and studio venues. Sound techs have really loved this thing. Many of the pros who are loving it have spent time tweaking their rigs. The KickPort is a tool, but not a cure-all. If you put the KickPort in a bad-sounding drum, the drum will most likely still sound bad. It is important to keep in mind that whenever you add a new component to your rig, you usually have to make some adjustments. The KickPort absolutely has the ability to achieve amazing results in pretty much every drum. If somebody wants to drastically improve their kick sound, this tool can help them accomplish that… no question about it! Anyway, I was so impressed by what I heard at NAMM that I have purchased a KickPort for myself. I will do some intensive studio demos and publish the results here soon. I’ll say right now that if my studio test is anything like my experience at NAMM, then I’d suggest every studio owner go buy a pair of these. It is much easier to record a great-sounding drum than to “fix” a bad one later — and yes, I speak from sad experience on this matter. Previously: The CMV-563, every man’s dream! Shoot, this thing’s only $40? I just might have to try it out. Yes, $40 for now. I’m not sure what their actual street prices will be once they hit full production. I agree, for the effect I heard, $40 is cheap. 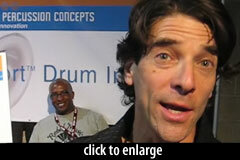 Jesse Bradman here from Future Percussion Concepts – The KickPort company. I sure appreciate all the discussion about our product! And thanks to Matt for spending some time with the KP. We have had a wonderful week with Gerry Brown and Kenny Aronoff letting us know how much they “love the KP” among others. I can assure you this is no gimmick – we spent over four years working on it. It has been used with wonderful success in the studio – I recently received a note from Curt Bisquera with a recorded groove telling us how great it sounds recorded. A comment about Matt McGlynn’s review. At the time that Matt used the product, he was using it in conjunction with a felt pad on the inside of the head which basically took away all the qualities the KP offers. The ‘Getting the Most Out of the KickPort document which can be downloaded from our website clearly advises against any dampening/muffling materials touching the resonant head. Because Matt was unable to provide a head without muffling/dampening, FPC has provided him with a head so he can use the KP in the manner it was designed to be used. As he is a drummer I can assume he understands that adding weight to the res head will make the res head react differently. Thus, one would likely want to tune the head a bit different as well, not to mention removing most or all dampening materials in the interior. The KickPort is a tool and to enjoy the dramatic improvement it can offer, one must use it in the manner it was designed to be used – just like any other tool. And just like any new piece of gear, one usually must make adjustments to existing setup. I know this from playing keyboards with four platimum bands when I received a new piece of new gear…it took some work to really get the most out of it. As Jotan Afanador told me a couple weeks ago; “When I first tried the KP it was really cool, a solid improvement. Then I really spent some time with it, fooling around with different head combinations, taping off the plastic muffling ring as Jesse suggested etc.” then I played around with tuning and internal dampening materials. Now that I have this down, this thing is amazing – truly an incredible product!” If you want, email Jotan – he has a website and would likely be more than glad to respond. the KickPort is a complex tool. It may look simple to copy but believe me it would not be as easy as one thinks – not to mention Patent Infringement :). We have professional drummers out on the road and in the studio having tremendous success with our product. The Testimonials on our website are a small sample. I would be pleased to have anyone me directly if any of you have specific questions!